The Medium Tank M4, better known as the Sherman, appeared in various forms throughout its stellar career with Allied armies. One of the lesser known variants is the M4A3 (105mm), of which five hundred were manufactured between April and August 1944. The 105mm howitzer gun was fitted so that the vehicle could serve in the close support role, rather than in the usual tank role, but they were not widely seen until towards the end of the war. Precisely such a vehicle has now been introduced in 1/72 model kit form. 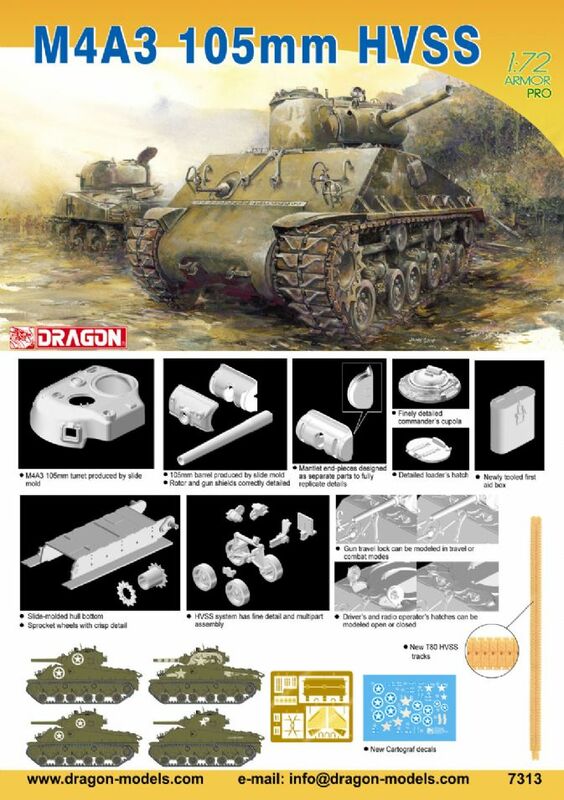 This kit represents a vehicle with the Horizontal Volute Spring System (HVSS), and it also has the applique' armor panels added to the hull sides to further protect the ammunition stowage bins. Many parts such as the 105mm gun barrel and complete turret are produced from slide molds. New parts appearing on this kit are a new first aid box attached on right hull side and the T80 Tracks by DS.